I love punch. I love making punch. I love drinking punch. And so does everyone else I know. It is a proven fact that punch makes parties better - because you can actually enjoy the party instead of making everyone margaritas! 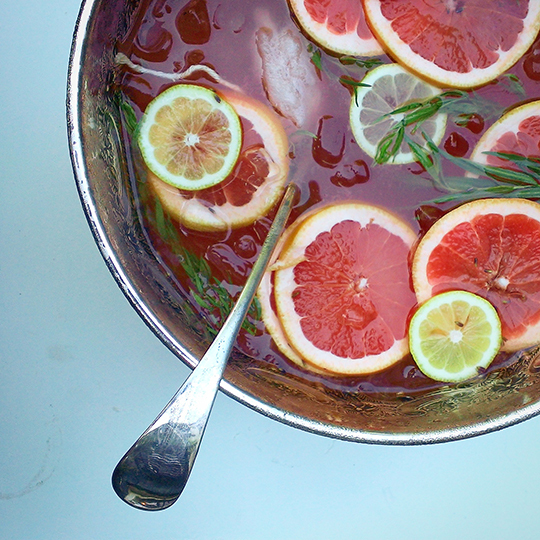 I'm always on the lookout for good punch recipes, and this one is too good not to share. It was created by Masa Urushido of Saxon + Parole in NYC, and he shared the recipe on his instagram account (thank you). It is just the right amount of boozy, fruity, and refreshing, everything you want in a nice summer punch! Build over an ice block, garnish with slices of Grapefruits, Lemons, and Fresh Tarragon. Peel two pink grapefruits and put in a ziplock bag with 1/2 C sugar and the Lilac (can substitute dried Lavender). Place in the refrigerator overnight until it becomes a syrup. The punch sounds amazing...but I'm really just geeking out over the Lilac-Grapefruit Oleo Saccharum right now. I want to try that with everything in my liquor cabinet. And then possibly ice cream.